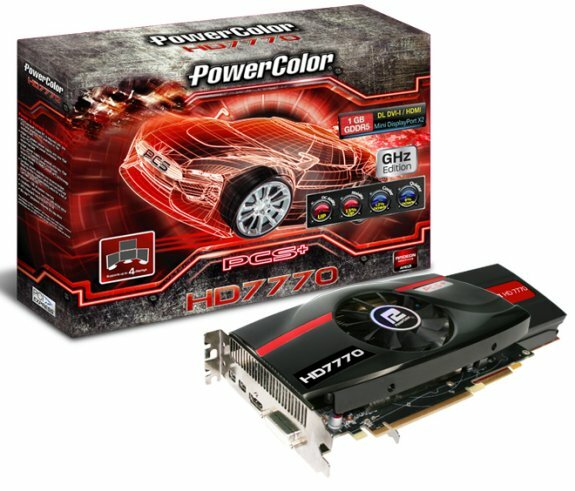 PowerColor introduces the PCS+ HD7700 GHz Edition, a new Radeon HD 7770 model with a 1150MHz core (vs 1000MHz stock) and 1GB GDDR5 memory clocked at 5000MHz (vs 4500MHz stock). TUL Corporation, a leading manufacturer of AMD graphic cards, today announces a new flavor into HD7700 series: the PCS+ HD7770GHz Edition. Packed with factory overclocked setting, the PCS+ HD7770 delivers the out-of-box gaming performance with core speed at 1150 MHz and memory speed at 5.0 Gbps; based on the advanced 28nm GCN architecture and PCI Express 3.0, the PCS+ HD7770 enables the best efficiency and extraordinary performance by doubling the bandwidth between GPU and CPU. PowerColor PCS+ HD7770 has equipped with solid cooling design; by utilizing heat pipe direct touch technology, it can be cooled down efficiently through heat pipe which fully covers GPU, easily carrying away excessive heat from large extrusion heat sink and cooling fan on top. Moreover, with smart fan control technology, this edition enables the best user experience through automatically fan speed controlled. Support with the industry-leading technology, PowerColor PCS+ HD7770 features AMD Eyefinity 2.0 technology and AMD HD3D Technology, enabling multi-display stereoscopic 3Dcontent and delivering an immersive “wrap around” gaming experience. Also, it packed with AMD PowerTune technology, this intelligent power monitoring technology allows higher clock speeds and better performance when needed, delivering the most efficient way for gaming like never before.